This is definitely one of the most peculiar Scottish activities! Tossing the caber is one of the sports that take place at a Highland Games event. If you come to study here during our summer you may be able to go to a Highland Games. Highland Games, which originated in the Scottish Highlands and are now celebrated all over the world, are a wonderful day out, involving Highland dancing, bagpipe music and various athletic events. We’ll write about Highland Games in another blog soon. Tossing the caber is a ‘heavyweight’ sport. It’s for large, very strong men, who have to pick up and then ‘toss’ a long, very heavy wooden pole, called a caber. In fact, it’s a tree trunk that has been cut and had the branches trimmed off it. 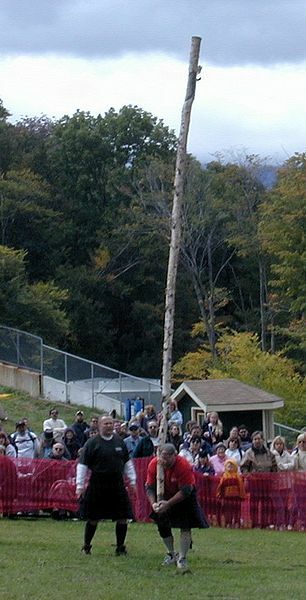 The length of the caber can be from 16 feet to 22 feet (about 4.8 – 6.7 metres). One end is trimmed so that it’s slightly smaller than the other. The caber is held upright and the thrower cups his hands under the end and lifts it up vertically, before ‘tossing’ it forwards. It’s not a question of throwing it as far as you can: you also have to try to ‘toss’ it so it goes in a straight line in front of you (imagine it going straight out like 12.00 on a clock). Marks are awarded for how straight you toss it. The distance it goes is not actually important and no marks are awarded for this. It’s also very difficult, as this YouTube video, from a Highland Games in Nova Scotia in Canada, shows! – our new Agent from Taiwan! Although we know that a lot of our students Google us and find out more information about the School from our website, we also know that a lot of our students come to us from agents in their home countries. That’s why we are always pleased when we start to work with a new agent. Andrew Lennox, the School’s President, recently met with Jocelyn Lin, our latest agent in Taiwan, in our Edinburgh office. Thank you Jocelyn – we are really looking forward to working with you and we hope that we’ll see some students arriving from Taiwan to study at our Schools in Scotland in the very near future.